Seven graphic designers pay tribute to their former tutor. The design tutorials of Bas Oudt, who taught at the Rietveld Academy between 1990 and 1996, were for many of his students an extraordinary experience. His power of observation and unique vision in the field enabled him to easily pass on his fervor for ‘designing’. 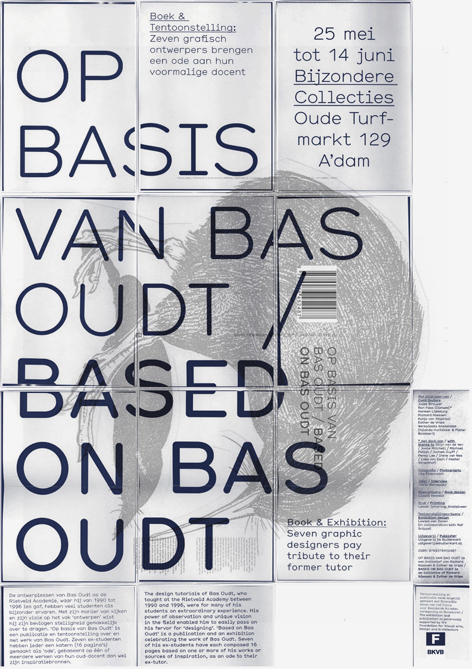 ‘Based on Bas Oudt’ is a publication and an exhibition celebrating the work of Bas Oudt. Seven of his ex-students have each composed 16 pages based on one or more of his works or sources of inspiration, as an ode to their ex-tutor. This entry was posted on Tuesday, May 19Graphic Design. You can follow any responses to this entry through the RSS 2.0 feed. Responses are currently closed, but you can trackback from your own site.